The sun has its own magnetic field, which varies in both amplitude and spatial configuration over time. 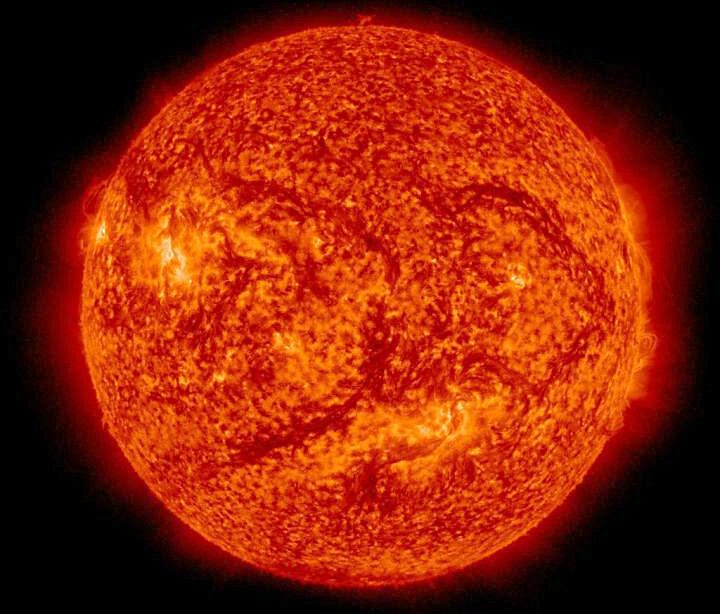 The changes in the strength of the magnetic fields in the solar atmosphere results in changes of electromagnetic radiation from the sun, changes of the intensity of plasma flows coming to Earth, as well as the number of sunspots appearing in the photosphere (the visible lowest layer of the atmosphere which might be called the surface of the sun). They studied the changes in sunspot number, with a cyclic structure varying approximately every 11 years, which also has an impact on Earth’s environment. The number of sunspots goes through several cycles with different periods and properties. The most well known of these is the 11-year cycle. There is also a 90-year cycle associated with periodic reduction in the number of spots in the 11-year cycle. See Fig. 2. In 17th century, though, there was a prolonged reduction in solar activity, called the Maunder minimum, which lasted roughly from 1645 to 1700. During this period, there were only about 50 sunspots observed. That is a far cry short of the usual 40 or 50 thousand sunspots observed in a single year. In addition analysis of solar radiation has shown that its maximum and minimum intensity almost coincide with the maxima and minima of the number of sunspots. The new study was better able to characterise the changes in the sun’s total magnetic field for three past cycles of solar activity (cycles 21, 22 and 23) using a technique called “principal component analysis.” Note we are currently in cycle 24. This technique allowed the researchers to better identify waves with the largest contribution to what is observed. The method can be compared with the decomposition of white light into a rainbow of colours using a prism. As a result, the researchers discovered that the magnetic waves in the sun are generated in pairs, with the main pair covering 40% of variance of the data. The principal component pair is responsible for the variations of the dipole field of the sun, which changes its polarity from pole to pole during the 11-year solar cycle. They were able to derive an analytical formula, describing the changes in these two waves. From that they calculated what should be the expected number of sunspots. And from there they made a prediction of the magnetic activity in the cycle 24, with a 97% accuracy when compared to observations. Figure 2: Sunspot number vs year. The blue curve represents the sunspot number per year and the black curve is my best fit. Data source: Royal Observatory of Belgium, Brussels. Based on their analytical formulation the researchers then made a prediction of what these two magnetic waves would do in the next two cycles, numbers 25 and 26. They found that the two principal waves become fully separated into the opposite hemispheres in cycle 26 and thus have little chance of interacting and producing sunspots. This means it will lead to a sharp decline in solar activity in years 2030—2040 and comparable with the conditions that previously existed during the Maunder minimum in the 18th century. This result is totally in line with the prediction of John L. Casey, who predicted by 2030 global cooling on the scale of the Dalton Minimum or the Maunder Minimum . See Fig. 2. If these predictions are correct we are in for some cold winters over the next 2 decades. The man-made global warming scare may then be relegated to the dustbin where it rightfully belongs. Diminishing solar activity may bring new Ice Age by 2030, Astronomy Now, July 17, 2015.